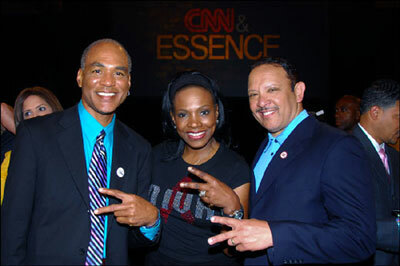 Phill Wilson, Sheryl Lee Ralph and Benjamin Jealous at a previous Essence Festival in New Orleans. An estimated 1 in 48 Black women will be diagnosed with HIV during her lifetime. The desire to move the needle on this dire indicator drove the Black AIDS Institute’s annual participation at the 2017 Essence Festival Presented by Coca-Cola, which took place June 29-July 2, 2017, in New Orleans. In collaboration with their partners the Kaiser Family Foundation and the Louisiana Office of Public Health, the institute provided free HIV testing, HIV prevention education and raffles for prizes in the Community Corner of the Expo Hall of the Ernest N. Morial Convention Center. Billed as the “party with a purpose,” the Essence Festival draws over 400,000 attendees to the series of free empowering and educational daily activations, exhibits, and talks paired with nightly concerts featuring some of the biggest Black artists. Catering to the lives and lifestyles of Black women, the festival is the optimal location for the Institute and its partners to provide HIV testing and HIV prevention education resources to this often underserved demographic group. While only 13 percent of the U.S. population is Black, Black women make up a staggering 61 percent of HIV diagnoses among women. After MSM, Black women are more likely to be diagnosed with HIV than members of any other demographic group. Yet, usage of the groundbreaking HIV prevention method pre-exposure prophylaxis (PrEP) among Black women is low, and PrEP up-take among women falls along racial lines. Black women are four times less likely than their white counterparts to fill a PrEP prescription. Indeed, a survey of PrEP knowledge among Black women attending a prior Essence Festival revealed low levels of PrEP awareness. Because most public health campaigns about PrEP target MSM, women of any race rarely receive PrEP messaging. Black women’s increased use of PrEP is key to stemming the tide of new infections, so the Black AIDS Institute has undertaken a concerted effort to increase PrEP awareness among this group. The Institute featured PrEP information in its prevention, education campaigns at the Essence Festival, and it offered daily “mini lectures” about Black women and PrEP to increase awareness, and address common barriers to PrEP usage. Consistent with the intent of the festival, the Institute spoke to and with Black women about their lives and experiences, particularly when it comes to preventing HIV. Because not every Black woman can attend the Essence Festival, we hope you’ll take advantage of resources on the HIV epidemic and PrEP for Black women compiled by the Institute, the Kaiser Family Foundation, and the Louisiana Office of Public Health, as well as the PrEP Locator, an online geolocation tool that identifies PrEP providers by zip code. Justin Woods is a program coordinator for the Black AIDS Institute.